Iran's long-exiled Crown Prince Reza Pahlavi speaks during an interview at the Associated Press bureau in Washington, April 6, 2017. Iran's exiled crown prince wants a revolution. Reza Pahlavi, the son of the last shah to rule before the 1979 Islamic Revolution, has seen his profile rise in recent months following the election of U.S. President Donald Trump, who promises a harder line against the Shi'ite power. Pahlavi's calls for replacing clerical rule with a parliamentary monarchy, enshrining human rights and modernizing its state-run economy could prove palatable to both the West and Iran's Sunni Gulf neighbors, who remain suspicious of Iran's intentions amid its involvement in the wars in Iraq, Syria and Yemen. But the Mideast is replete with cautionary tales about Western governments putting their faith in exiles long estranged from their homelands. Whether Pahlavi can galvanize nostalgia for the age of the Peacock Throne remains unseen. "This regime is simply irreformable because the nature of it, its DNA, is such that it cannot," Pahlavi told The Associated Press. "People have given up with the idea of reform and they think there has to be fundamental change. Now, how this change can occur is the big question." Pahlavi left Iran at age 17 for military flight school in the U.S., just before his cancer-stricken father Mohammad Reza Pahlavi abandoned the throne for exile. The revolution followed, with the creation of the Islamic Republic, the takeover of the U.S. Embassy in Tehran and the sweeping away of the last vestiges of the American-backed monarchy. Yet the Pahlavis and the age of the monarchy have retained their mystique in Iran, even as the majority of its 80 million people weren't alive to experience it. Television period pieces have focused on their rule, including the recent state TV series The Enigma of the Shah, the most expensive series ever produced to air in the country. While incorporating romances or mobsters into the tales, all uniformly criticize the royal court. 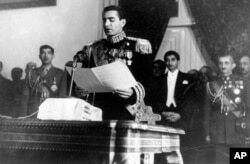 FILE - The Shah of Iran, Mohammad Reza Pahlavi, reads his inaugural speech at the initial session of his nation's first senate in Tehran, Iran, Feb. 16, 1950. But Pahlavi, 56, insists young Iranians increasingly look toward Iran's past. He pointed to recent demonstrations at the tomb of the pre-Islamic King Cyrus the Great, which have been claimed by a variety of anti-government forces as a sign of unrest. Under his father's secular and pro-Western rule, Iran experienced a rapid modernization program financed by oil revenues. "If you look at the legacy that was left behind by both my father and my grandfather ... it contrasts with this archaic, sort of backward, religiously rooted radical system that has been extremely repressive," Pahlavi said. Since the U.S. election, Pahlavi has given a growing number of media interviews, including with Breitbart, the website once run by Trump's chief strategist, Steve Bannon. Pahlavi also has sent letters to the Trump administration. Gauging national sentiment toward restoring the monarchy in Iran is impossible, especially after the crackdown that followed the country's disputed 2009 election. Iranian state media routinely refer to the Pahlavi monarchy as "despotic," but there has been some reassessing of history in other quarters. A book published last year, The Fall of Heaven: The Pahlavis and the Last Days of Imperial Iran, offered a revisionist view of the shah. While acknowledging the abuses of his feared SAVAK intelligence service and the corruption surrounding his rule, the book portrays him as a fatalist in an era of disappearing Mideast monarchies. "The regime has repressed discussion of the Pahlavis for so long that it has had the opposite effect of making young Iranians inside the country curious about what they don't know," said historian Andrew Scott Cooper, the book's author. "There's an interesting generational divide going on here to where young Iranians are saying to their parents and grandparents, the same people who marched against the shah and Pahlavis, 'Why did you get rid of that system and put this one in place?'" He added: "The family name still retains a lot of magic, more than ever today among Iranians. How that translates practically into support for Reza as a credible alternative leader, I just don't know." 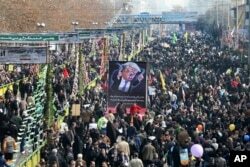 FILE - Iranians carry a banner showing a caricature of U.S. President Donald Trump during an annual rally commemorating the anniversary of the 1979 Islamic revolution, which toppled the late pro-U.S. Shah, Mohammad Reza Pahlavi, in Tehran, Iran, Feb. 10, 2017. Asked how his envisioned peaceful revolution could play out in Iran, Pahlavi said it would need to begin with labor unions starting a nationwide strike. He said members of the hard-line Revolutionary Guard, a paramilitary organization established to protect the clerical system, would be assured they wouldn't be "all hung and shot." Most importantly, he said Western governments need to keep their distance and not threaten military action. That's an exceedingly optimistic vision, especially considering the amount of power the Guard and other hard-liners wield in Iran's economy. It also largely ignores the concerns many in Iran have about Western meddling. Pahlavi's father took power following a 1953 coup engineered by Britain and the U.S.
Pahlavi, who still resides in the U.S., said he hasn't had any "side occupation" since 1979, and has received financial support from his family and "many Iranians who have supported the cause." "My focus right now is on liberating Iran, and I will find any means that I can, without compromising the national interests and independence, with anyone who is willing to give us a hand, whether it is the U.S. or the Saudis or the Israelis or whomever it is," he said. Pahlavi said he had yet to meet with the Trump administration despite his letters. Another Iranian exile group, the Mujahedeen-e-Khalq, previously paid a member of Trump's Cabinet $50,000 for giving a speech. However, the MEK's siding with Iraqi dictator Saddam Hussein during the Iran-Iraq war in the 1980s and its killing of Americans before the revolution, which the group now denies, makes it an unsuitable partner, Pahlavi said. "It's pretty much a cult-type structure," he said. For now, Pahlavi said he looks forward to meeting with Trump and his administration. But he pins his hopes on Iran's sense of history, something Cooper also acknowledged. "For many Iranians, the revolution is unfinished business," the author said.